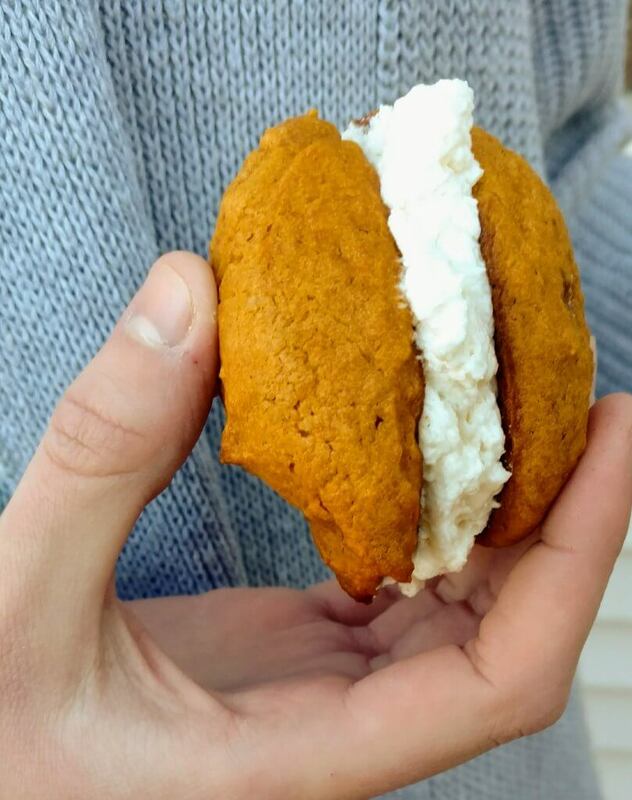 Pumpkin Whoopie Pies with creamy ginger filling recipe! The whoopie pies come out for a photo session, and so does Goldberry. You know that the holidays loom. In our extended Young family, we have many serious discussions about the menus for the family gatherings that are coming up. Many! A plethora of superb cooks make up our family, and the food is always delicious and plentiful, so one thing I aim for: to arrive on the cusp of the holiday season (that is right now) just a tad underweight. Yes, perhaps even a bit wan. My mother will hover close to me, urging me to have another of her cloud rolls (with softened butter). This feat (the underweight part, not the mother’s urging rolls and butter part) is not easy to accomplish, barring a particularly bad case of the stomach flu (God forbid!). Of course, the closer I get to middle age (harhar) the more difficult it is to lose a couple of pounds, especially during the cold seasons, when daily walks and bike rides with Mack are not so easily accomplished. But oh well. There are always stretchy pants. Here’s the truth on secret crushes: I have so many of them. It seems that the older I get, that is to say, as middle age looms (har) the more vulnerable my heart becomes. A beautiful sunset or a super-sweet look from my puppy’s eyes will reduce me to sudden tears (honest). A really good cup of coffee when I need it (that is to say, most of the time) or a beautifully written poem can precipitate a touching fit of sobs, which I can then return to at any time, with just a passing thought. (I know. Pitiful.) Anybody with me on this? And poor little Mack. He is not adjusting well to having an oft-hysterical mother. But–to his credit–though he’s not by nature comfortable with physical touch, he is learning, very cautiously and extremely occasionally, at the appropriate times, to put a tentative hand on my arm. Well, a finger. Or to even put stiff arms around me, when he notices (to his horror!) that I’m moved to tears at a touching Mary Tyler Moore episode. Ready? Okay (mustering up my courage). Vulnerable moment here. Deep, shaky, fortifying breath. Here it is: I am absolutely in love with . . . gosh, this is an embarrassing admission . . . the . . . I’ll just say it, all at once . . . the creamy stuff that you find inside filled donuts. Any type of light, creamy filling, actually. You know what I’m talking about. 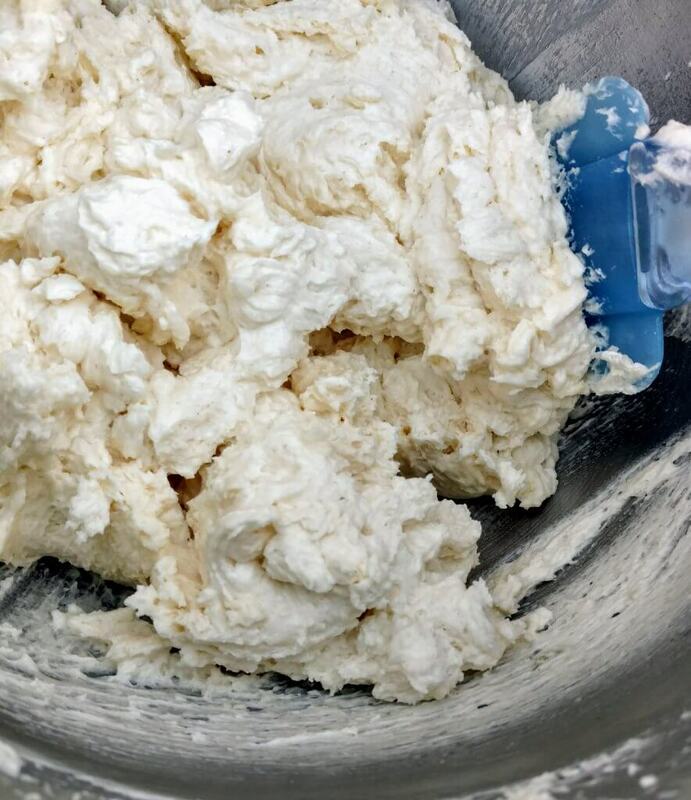 It’s not just whipped cream (which, I’ll admit, I love too) but a creamy filling that you find in pies, in certain pastries, as a filling in cakes and . . . between soft cookies. Like whoopie pies. Oh, my. 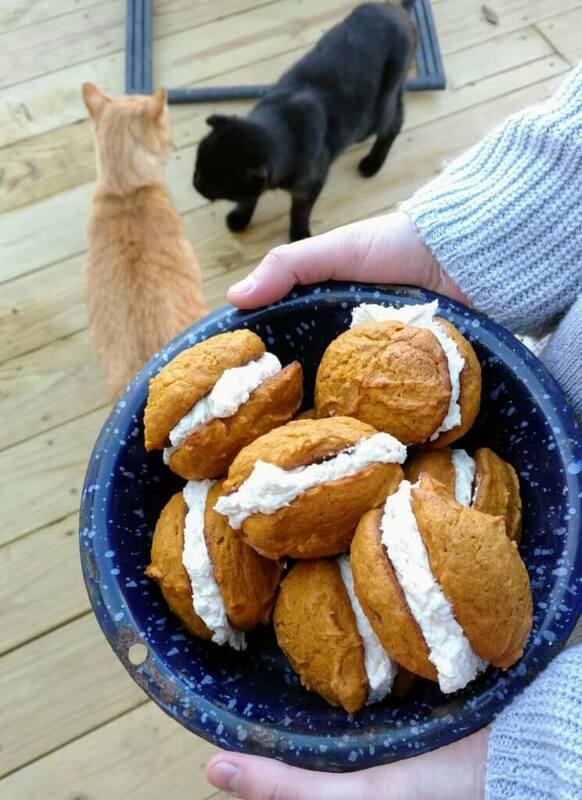 The first time that I encountered homemade whoopie pies–filled with this lovely creamy filling–-though I am usually pretty careful about not eating a lot of sugar, I ate three of them. At the counter, over the sink. In the dark. Standing in a church basement kitchen, all by myself. That’s a lotta whoopie pie to consume for this semi-smallish personage that I (currently!) happen to be. Undoubtedly I went home with a stomachache that night. I deserved it. I didn’t even care. Not a wit. Here’s what I’m talkin’ about. Oh yeaaaah. So back to Thanksgiving. And pumpkin. And, now that we’ve introduced the topic: creamy filling. I’ve been working on this recipe ever since I bought an unusually large amount of butternut squash, which–if you have it!–works quite well instead of the canned pumpkin. Because I love ginger and personally believe that it’s a perfect accompaniment to nearlyeverything pumpkin/butternut squash, I added some chopped candied ginger to the recipe. And some extra ground ginger, too. And the creamy filling? Start slowly with these babies, so you don’t have to break out the creamy filling. One. At. A. Time. It’s everything that you might dream of in a creamy filling, and then even more so. 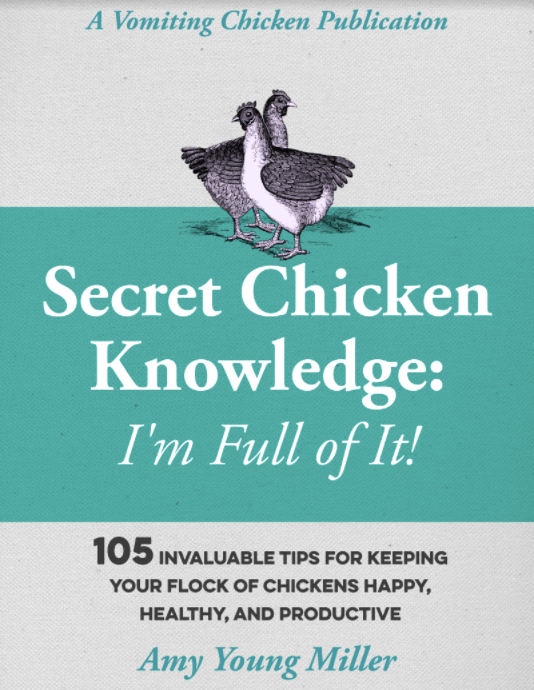 It’s the creamy filling that will transform you into a RAVENOUS WOLF (or SHE-WOLF, as the case may be) and that, gentle reader, happens to be a good thing, in this case. You can, of course, leave all the extra ginger out of the recipe, if you’d prefer it. It’s a free country, after all, where ginger additions are concerned. But, hey: double ginger. And creamy filling. All in the same cookie: oh boy! Cream butter and brown sugar until light and fluffy. Beat in vanilla. In another bowl, whisk the next six ingredients (and the optional candied ginger, if you wanna); beat into creamed mixture alternately with pumpkin. Drop by rounded tablespoonfuls 2 in. apart onto greased baking sheets; flatten slightly with the back of a spoon. Bake 10-11 minutes, or until bottoms are firm (no human parallel here). While cookies are baking and cooling, combine flour and salt in a small saucepan. Gradually whisk in milk until smooth; bring to a boil over medium-high heat. Reduce heat to medium; cook and stir until thickened, about 2 minutes. Refrigerate, covered, until completely cooled. In another bowl, beat shortening, confectioners' sugar and vanilla until smooth. Add chilled milk mixture; beat until light and fluffy, about 7 minutes. Spread on the bottoms of half of the cookies; cover with remaining cookies. Store in the refrigerator. Now, word to the wise gentle reader: if you make a batch of these, be sure to invite somebody over to help you eat them. Coffee goes nicely with them, too. Or else you may just have to go pants-shopping right before Thanksgiving, to buy a larger size pants, and who wants to do that?? And, by the way, if you have a dollop or two of leftover creamy filling . . . it goes really well on graham crackers. Or straight off the spoon. Sheesh! Were you fat-and-sugar deprived as a girl? Wouldn’t it be simpler to just have a bowl of sugar and a bowl of whipped cream in front of you (and a spoon) and just dig in? Isn’t there some way you could simply inject that stuff? harhar, Gene! Now that I think of it . . . maybe I was. Okay, next grocery shopping day, I will load up on butternut squash (which I much prefer to pumpkin), and candied ginger, and whatever spices have run out. And I vow that I will make these with gluten free all-purpose flour and will report back to your dear readers, just in case there is one out there that shares my problem with gluten. It will be a while, since yesterday was grocery day. Thanks, love, for the great writing, and for the wonderful recipe. Which is heading to my vast archives of “I want to try this NOW” recipes. Have a wonderful holiday with your incredible family! Thank you, Diane! I hope your holidays are blessed and wonderful, too! Oh girl, that’s me in a nutshell, ha! Everything, the food, almost midlife weepys. I don’t think it’s because we’re pitiful, just more sensitive to the little things, because they are the big things. Sometimes as we age(ha) we lose our excitement. So here’s to creamy filling, coffee and every other yummalicious moment we can find. May you and yours have a blessed Thanksgiving! Thank you, dear friend Kathleen. I hope your Thanksgiving was especially blessed. Ours certainly was. God does know how to give wonderful gifts to his children. I am so with you there, it’s absolutely all about the creamy filling. I called it filmy creamy when I was little and now that’s what the whole family unto the next generation calls it too lol. You rock! Oh and btw, all about the stretchy pants for Thanksgiving, jeans are so last decade! I’m excited to try the cookie recipe. 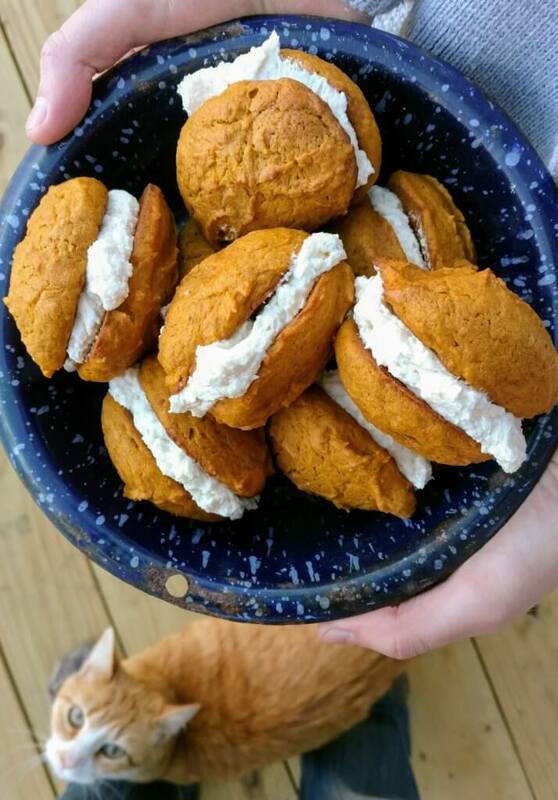 I have a marvelous soft ginger cookie recipe but I think this one with pumpkin/squash might be an excellent alternate, with or without the filling! Good luck with the recipe, and thanks for your daughter’s advice to Mack (in advance). Pity there is no “human parallel ” for the firm bottom!! This cream sounds perfect for putting between oatmeal cookies. My poor spouse had to cope with my shift from someone who ONLY cried for the death of a beloved person or pet,to someone who tears up for any sort of sentiment in any form. 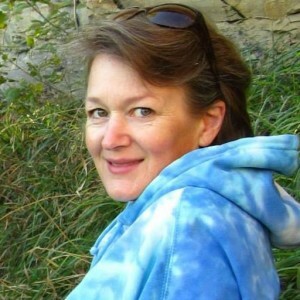 Leaving middle age behind did not change me back. At least the tears wash the dust from my eyes! Janet, I think you could use the cream filling for a lot of different desserts. It’s similar to the creamy frosting that I make for my favorite red cake!